The weeks previous to December 25, the celebration day known as Christmas in Europe and America, is a season of joy in most countries the holiday is observed in; but even the best of times can have dark parts to them. For instance, in Iceland legends tell of a gigantic cat that eats people who do not wear new clothes on Christmas Eve! The beast is called the Jólakötturinn, which is generally translated as 'Christmas Cat'. If it sounds a bit mean that the cat only feasts on those who don't get new clothes, don't worry; there's a bit of a trick to the whole matter. Though the legend of the Jólakötturinn was represented as ancient, it appears that it wasn't really told previous to the 1800's; and it was largely being used by farmers to motivate farm-workers to finish the autumn wool harvests before Christmas... those who helped get the work done got new clothes, and those who didn't help didn't get new clothes. So the giant cat was mainly a threat to workers who didn't do their job! In addition, some legends merely threaten that the Christmas Cat will eat the Christmas feasts of people without new clothes. The idea that the cat was a man-eater became popular after the Icelandic poet Jóhannes úr Kötlum wrote a well-known poem about the giant feline... and some newer tellings of the legend, mostly in English, now claim the Christmas Cat eats mainly just children. So if you get caught in Iceland at Christmas Eve with only old clothes, you'd better hope the worst that happens is that you don't get dinner! "The Christmas Cat," by Haukur S. Magnusson, page in the Reykjavik Grapevine website, posted 12-10-2008, viewed 12-13-2016. Online: Click here! Timarit hins Íslenzka bókmentafèlags, Volumes 10-12, by Íslenska bókmenntafélag, 1889 Reykjavik, Iceland. Online [in Icelandic]: Click here! 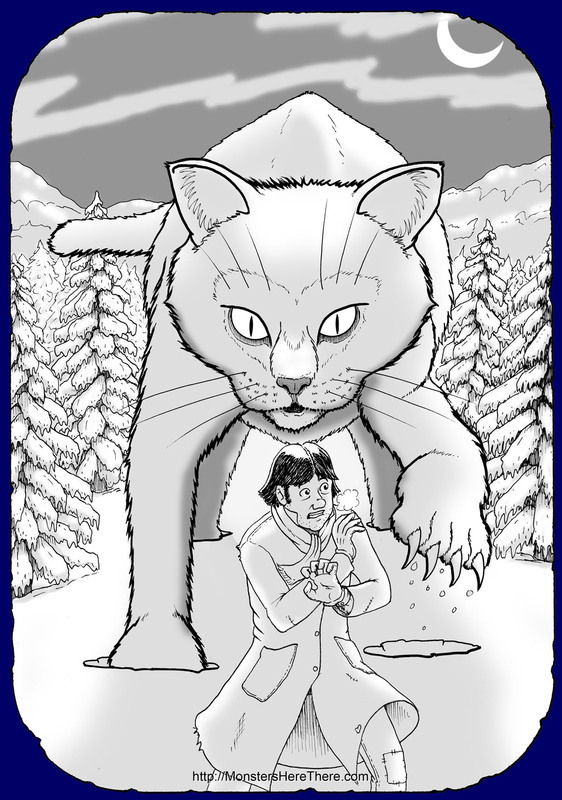 "The Christmas Cat of Iceland - a giant terrifying cat that gobbles up children if they're bad," page in the i iz cat website, viewed 12-13-2016. Online: Click Here! "Jólakötturinn," article online in the National Museum of Iceland website, posted 12-29-2014, viewed 12-13-2016. Online [in Icelandic]: Click Here! "Jólakötturinn," page in the JoHannes website, posted 12-8-2007, viewed 12-13-2016. Online [in Icelandic]: Click here! "Yule Cat," article in the Wikipedia website, viewed 12-13-2016. Online: Click here! "Yule," article in the Wikipedia website, viewed 12-13-2016. Online: Click here!